These Thanksgiving Stuffing Waffles take everyone's favorite holiday side dish and bring it to a whole new crispy, delicious level—by cooking it in a waffle iron. Perfect for the big holiday, or just for using leftovers! You know how Facebook has that "On This Day" thing, where your old posts pop up in your notifications? It's fun to see photos of my son through the years, as well as status updates I totally forgot about. 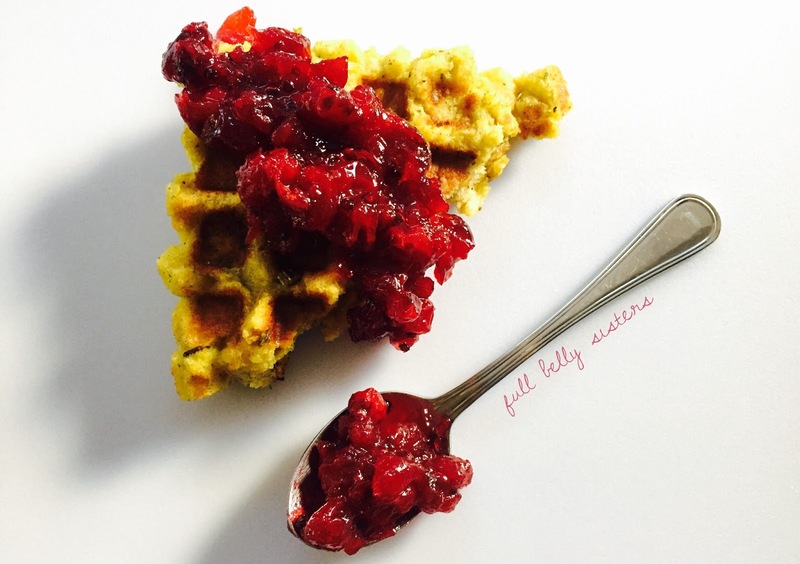 Well, apparently, I shared this Serious Eats post about Stuffing Waffles on my timeline over two years ago! Yet somehow, I never made them. Until now. 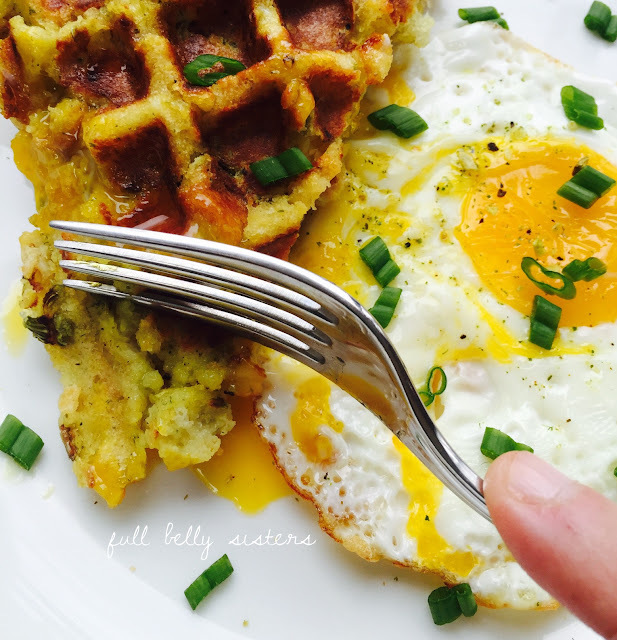 I made some stuffing waffles for brunch today and served them with fried eggs; it was a wonderful savory meal that would be great way to use leftover stuffing after the holidays! 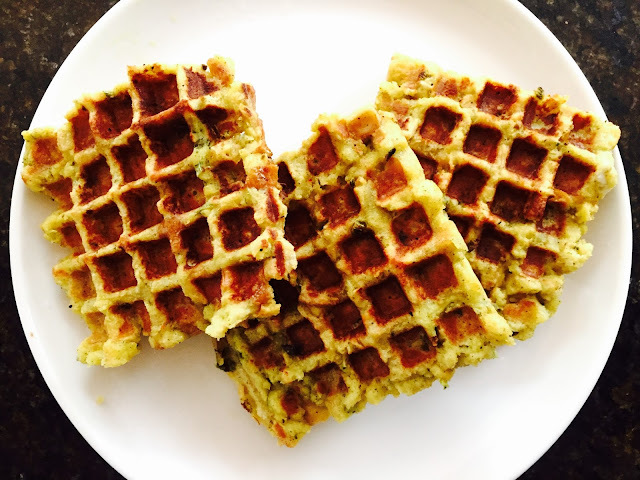 Of course, you could make a platter of these Stuffing Waffles to serve at Thanksgiving using your favorite recipe; it would be a great way to free up some oven space. Or just make them for a regular ol' weeknight meal using a good boxed stuffing. These Stuffing Waffles are super easy. Just whip up a batch of your usual stuffing and, instead of cooking it inside the turkey or in a casserole dish, spoon it into your waffle iron. Make sure your stuffing is pretty moist and has some fat in it (like a beaten egg, milk, melted butter, and/or oil) so it cooks well and crisps up nicely. If you're using leftover cooked stuffing, try adding some broth and egg to moisten it a bit before waffling. Crispy and golden, with yummy bits of herbs. Mmm. I used my 2-Square Belgian Waffle Maker and set it at medium heat. Once it was preheated per manufacturer's instructions, I scooped in my prepared, uncooked stuffing mixture, filling the waffle cavities. 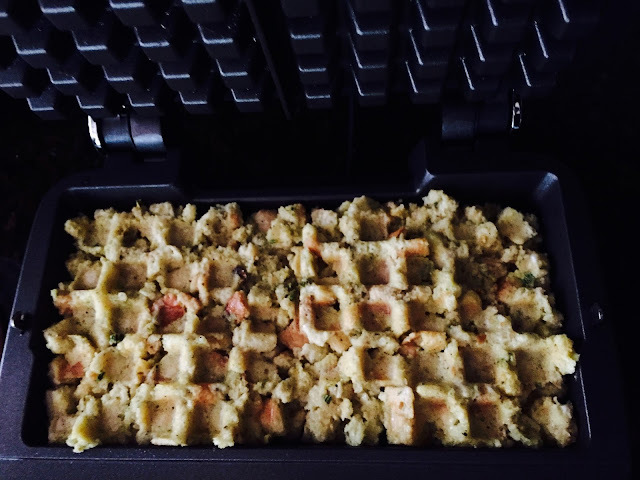 Cook a few minutes longer than you would a regular batter waffle; my stuffing waffles were ready in about 7 minutes. Each waffle iron is different, though, so keep an eye on them till you get the timing right. If you're using leftover stuffing, it will probably cook even more quickly. A little peek while the waffles cook. This was before they got really golden and crispy! 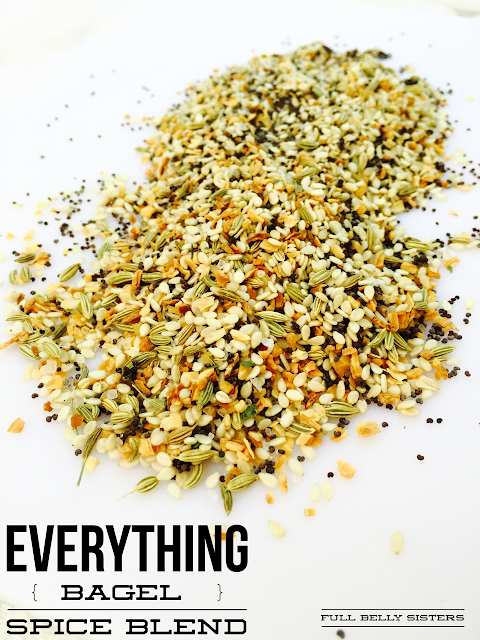 What's nice is that you can use whatever stuffing works best for you and your family. Vegetarian? Gluten-free? Meat-lovers? Go for it! Serve these Thanksgiving Stuffing Waffles at your holiday table or on your breakfast table the day after. Or use them to make my Ultimate Thanksgiving Leftover Sandwich (check back tomorrow for this insane deliciousness). No matter how you eat them, they are sure to rock your world. Now for the most important question of the season: do you call it stuffing or dressing? This post contains affiliate links, so I make a small commission if you purchase through my links—that support helps to keep this blog running. This looks like a dreamy breakfast for me! I will pin it straight away to keep it for later. I really need to give this recipe a try! Awesome! Looks fabulous! And thanks for the link love. I seriously need to try this! Yum! Awesome, let us know if you do! This looks delicious Justine!! :) Great idea to use up leftover stuffing! uuuuhhh! this looks so good!